About a month ago, we were in Seville, Spain for a short trip to visit our good friends, Sergio, Corinna and Sergio’s family. They threw a lovely seafood barbeque at home for us and introduced us to some of their local tapas bars and we revisited a few of the ones we ate at from our last trip a few years back. Foodwise, Seville is like a little hidden gem and I will share a write-up soon of the food we experienced there. In the mean time, I’m able to share a little ‘ode to Spain’ K prepared recently, with you. Lightly brown the chorizo on low heat (oil is not required as the chorizo will release enough to cook itself in). Keep warm in an oven on low heat (80°C) taking care that the chorizo does not crisp up. Blanche the peas and garlic in a pan of salted boiling water for 2 minutes. Remove the garlic, refresh it in cold water, remove its skin and trim its ends. Drain the peas, reserving some of the water, blend into purée with the garlic, butter and extra virgin olive oil. Loosen the purée with 2-3 tbsp of cooking water, season with salt and pepper; and keep warm. Heat a griddle pan until smoking hot, grill the scallops for 45 seconds on each side. 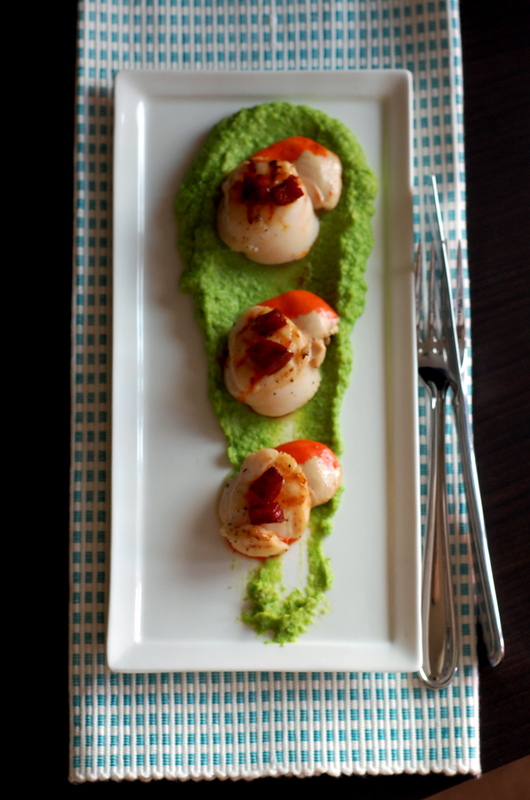 Check that the scallops are done by pressing lightly with your finger. 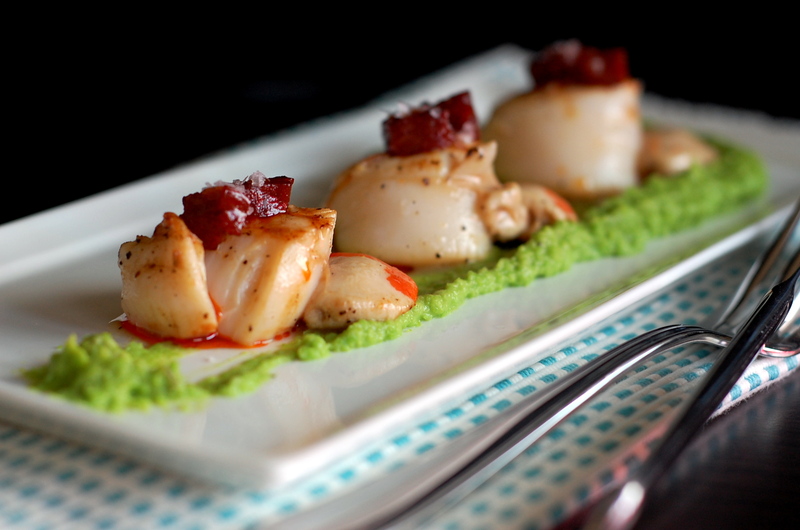 Arrange the scallops on the pea purée, top with chorizo and drizzle with chorizo oil. Season with sea salt. Reblogged this on Food I Relish. Christmas day starter, let’s hope i do it justice ! Good luck and hope it goes well. Merry Christmas!